University and College Union, on Tuesday, rejected a new proposal to resolve the pension dispute with Universities UK, which would have required both the university and their employees paying higher pension contributions. The strike is now set to continue for an additional fourteen days into the examination term. After the potential revised changes to the University Superannuation Scheme lecturers and students alike took to Twitter, criticising the agreement using the hashtag #NoCapitulation. It has been estimated that if the original proposal to pensions went through lecturers would lose an average of £10,000 per year. “The change [that the] UUK have foisted upon us with no consultation is the largest attack on our profession in my life. It is shameful that universities have forced their staff into having to choose between damaging the education of their students, or damaging their profession as a job that gifted students could be encouraged to aspire to”. 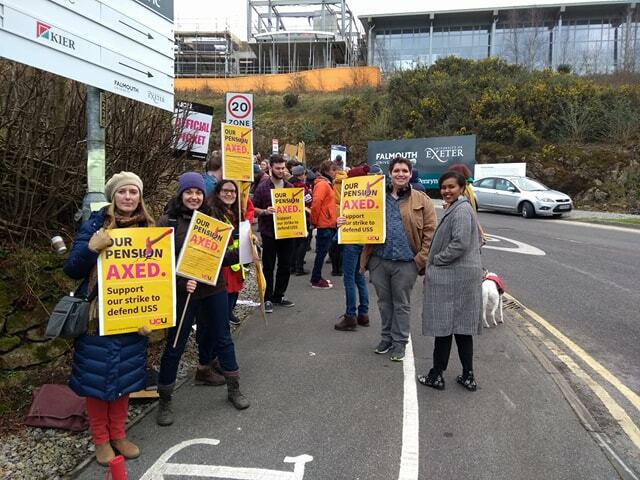 Speaking at the rescheduled FXU Discussion on UCU Strike Action last Wednesday, David Hosken, Dean of Cornwall Strategic Services, told students that those on the scheme would “have no idea” exactly how much money remains of staff pensions. While the figures remain disputed, the need for confirmation of the “level of deficit recovery contributions” suggests that the UUK has listened to the UCU’s outcry.